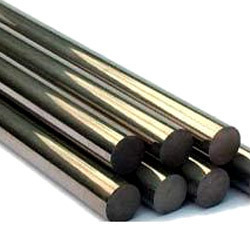 Nandishwar Steel export premium quality stainless steel rods & bars, flats, angle, channel & stainless steel round bars, which find application in different industries. While the angle channels are hot rolled, solution annealed, pickled and straightened, the bars are available in both varieties that include cold drawn & polished and centreless ground & polished. These angle channel & steel round bars are widely used as machined components, pump shafts, valves, fasteners, machine tools etc. Nandishwar Steel puts forward a range of Steel Rods and Bars such as stainless steel rods, steel bars etc which is procured from reliable vendors, who make use of tested raw material and efficient machines. Available in varied sizes and patterns, the range has carved a niche in the entire market, owing to its high tensile strength and durability. Also, it is custom-designed in order to meet the unique requirements of the clients.